2. Wi-Fi devices roam based on low received signal strength (RSSI) -- not missed Beacons, retries, low rates, interference, signal-to-noice ratio (SNR) or anything else. 3. 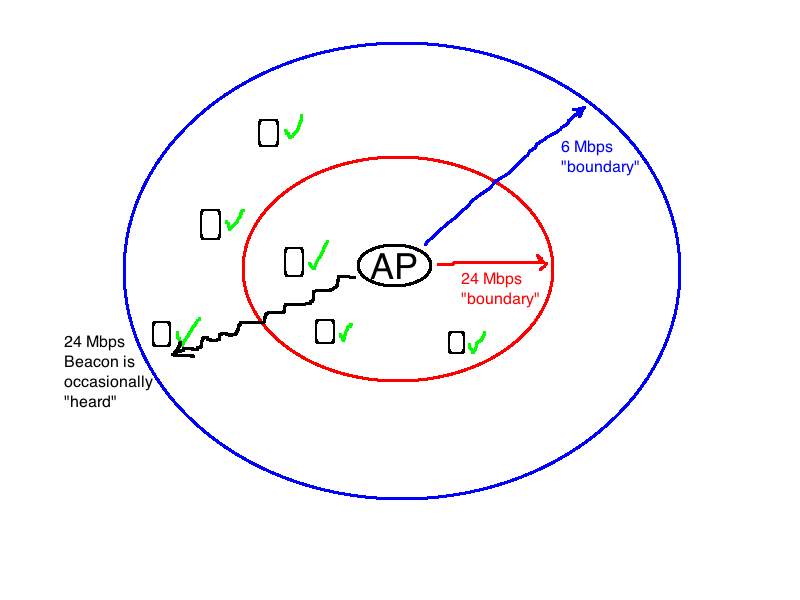 Wi-Fi devices control which data rates are used when they transmit -- it has nothing to do with which rates the AP supports. 4. 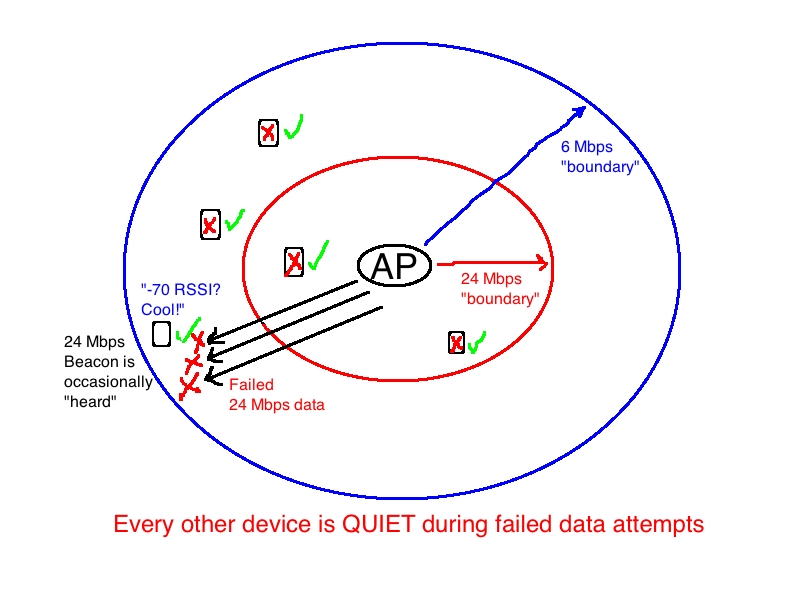 Successful de-modulation of Wi-Fi data is based on SNR -- not RSSI. So, please, stop disabling low data rates on enterprise Wi-Fi networks. If you don't, then I'll have to assume that these illustrations weren't good enough. I'll have spend my time learning how to use a slicker tool than Paintbrush instead of learning more about Wi-Fi, and that would be a major bummer. Hi there. Thanks for writing this topic - it's good to challenge the best practises time to time. In your blog you state that the client roaming decisions is always based only on RRSI. Could you explain this more? Countless documents say that the roaming decisions are based on the client driver code which can use packet errors and calculated noise together with RSSI. The idea that packet errors cause roaming is pure fiction and it doesn't even make any sense. Wi-Fi devices often naturally "hear" low signal "packets" (really called "frames" in Wi-Fi) from other networks. If devices roamed every time a frame from a nearby Wi-Fi network was "heard" at too low a SNR to de-modulate, you'd have devices constantly roaming and Wi-Fi would be unstable in virtually any semi-densely populated area.
" If devices roamed every time a frame from a nearby Wi-Fi network was "heard" at too low a SNR to de-modulate,"
Thankfully, that's not how WIFI works. The client monitors statistics about the conversation it is having with the access point it is associated with. When given criteria are met such as SNR, BER, etc., the client initiates a scan for a better AP. Are you arguing that Cisco doesn't understand how Cisco devices behave? Correct. Vendors publishing incorrect information about their own products is common. "Whoever told you that missed Beacons or Retries affects roaming either hasn't studied device behavior or was lying." "This decision is made via roaming algorithms that employ metrics such as RSSI indication, beacon loss, and frame acknowledgment. When the algorithm decides that a roaming threshold is met by the metrics, it immediately triggers roaming." 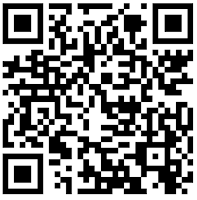 The document can be found from http://wi2wi.com/mgr/docs/Roaming_in_WLAN_rev0.2.pdf. I am talking about what triggers roaming. Those documents refer to the decision of which AP to roam to. "Devices send data at whatever rate they want to send data at, regardless of what rates the AP says it supports." If your have set your SSID to support only lets say 18 Mbps rate, that's the rate what all the (a/g) stations on that SSID use for sending data. You can test this easilly by using a a/g client, an AP and packet capture. Some vendors allow to specify the supported MCS rates as well. The might be some misunderstanding but could you expain how the stations in SSID can use different rates than the SSID is supporting? Don't get me wrong I realy like your blog but if you ask me this doesn't make any sense. Stations just do. I don't know how else to explain it. A station or AP chooses whatever rate it wants to choose when sending data. To summarize from a couple of your different blog posts, you do recommend turning off the 802.11B rates, but you recommend against turning off any of the slower 802.11G or N rates, and you outline why doing so could cause more harm than good. I use HP MSM access points, and when I look at my options for turning off 802.11B rates, the controller refuses to allow me to turn off all of them. If I try, it states "At least one of the rates for 802.11b must be enabled." So the closest I can come to turning off the 802.11B rates would be to turn off all of them except the 11Meg rate. I'm wondering your thoughts on this. Is turning off all but the 11Meg 802.11B rates accomplishing good by limiting access to B clients, or is it just an 802.11B only vesion of what you're cautioning against in this article while not successfully banishing 802.11B clients anyway? Disabling 802.11b rates banishes 802.11b clients. 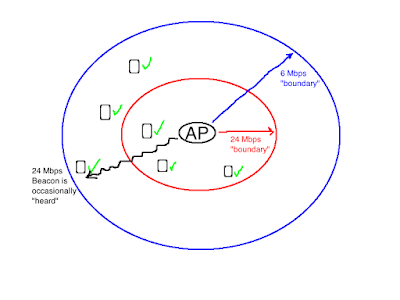 It could be that your APs have some different setting for banishing 802.11b clients? 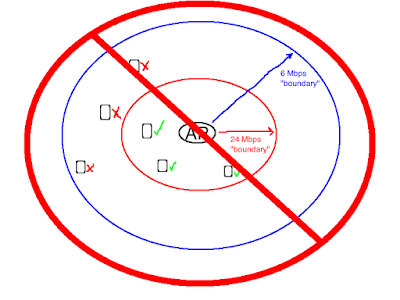 Can we use wifi beaming to send data over long distances, by creating a network of routers. The reason I ask is ,can we replace wired last mile internet connectivity using this method,by fixing routers on inclined position like a lamp post. Yes, this is exactly how many wireless ISPs operate. This wasn't the first time and won't be the last time that someone presents bad information at a Wi-Fi conference. So you aren't wrong, but rather Cisco, the 802.11 specifications, WIFI manufacturers and educators are all wrong. What can I tell you? Correct is correct and wrong is wrong. You'll have to ask them why they're wrong. This is not necessarily true. 802.11k and v detail AP directed roaming mechanisms. 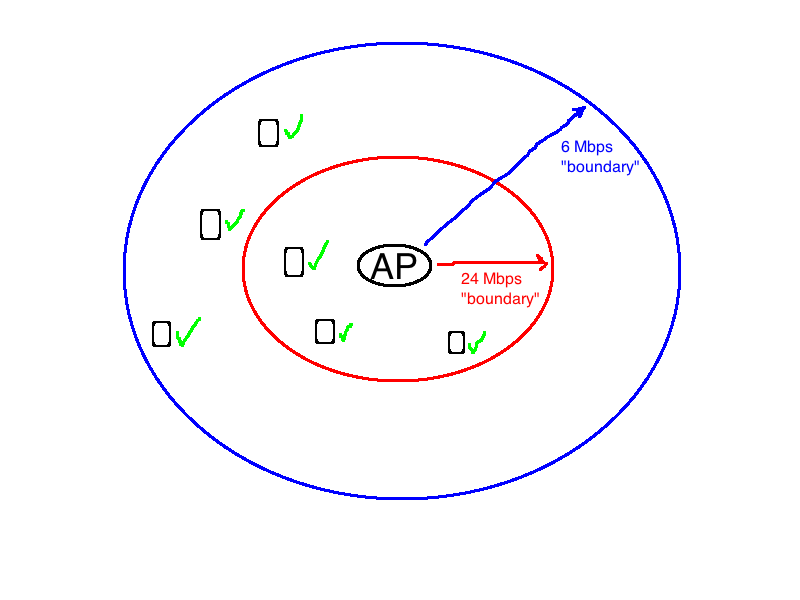 "The Access Point (AP) does not force disassociation if the client does not respond to beacons or if the client misses one beacon. 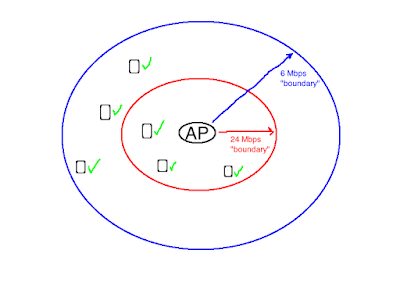 It only disassociates a client when it does not respond to data packets sent by the AP. However, this behavior is client specific. As far as Cisco clients are concerned, they disassociate or roam to another AP when they miss eight consecutive beacons". This is technically correct, but if a client tries to use a rate not supported by the AP, it will move no data. The AP provides the rates it supports in the beacon capabilities field. It would be supremely stupid for a client to ignore this information. This is not necessarily true. SNR is a raw RF metric. It makes no qualifications about the quality of the signal or what type of noise is present. You can have a wonderful SNR but still encounter nasty throughput issues. SNR says nothing about hidden nodes, mangled frames, multipath issues, Fresnel zone issues etc. RSSI is a non-standardized unit of measure that usually reflects received signal strength, but it is up to the chipset / driver vendor to determine what it means. Some vendors include things like Bit Error Rate in the RSSI calculation. You might want to look up "Cisco Optimized Roaming", another AP directed roaming method. Also, your description of the "6 Mb boundary" is completely backwards. Of course the client is always listening, but unless its WIFI firmware is complete garbage, it will not move data frames at that rate if the AP doesn't advertize that rate. On the contrary, an overly sticky client that's hanging on at a low rate will ramp up the duty cycle and consume available bandwidth closer, faster clients could be using as it fights to move it's own data - that's why you disable slower rates. To force distant clients to a higher rate where the BER forces them to roam. 802.11k and 802.11v are amendments that would allow the infrastructure to manage roaming, but real world Wi-Fi devices do not allow the infrastructure to manage roaming. Since the publication of this blog post, some devices have started roaming due to missed Beacons. RSSI is still what triggers roaming, in the vast majority of cases. 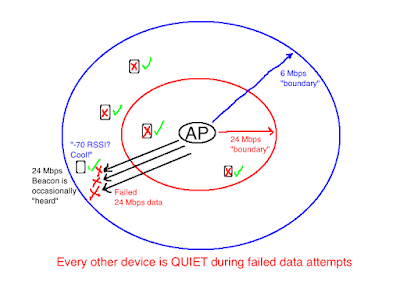 You are wrong about how APs respond to devices that send data using unsupported rates. Demodulation is based on SNR, plain and simple. The only thing mentioned that doesn't affect SNR is multipath, and, yes, multipath is a rare exception. "802.11k and 802.11v are amendments that would allow the infrastructure to manage roaming, but real world Wi-Fi devices do not allow the infrastructure to manage roaming." Cisco, Extreme, etc. support AP directed roaming right now. By extension, the "real world"
"Since the publication of this blog post, some devices have started roaming due to missed Beacons. RSSI is still what triggers roaming, in the vast majority of cases." This blog post is from 2016. Unless you're purposely ignoring devices designed for use in business environments such as manufacturing, warehousing, retail, offices etc, I.E. professional environments a network engineer is expected to understand, various roaming algorithms such as Sticky, Enterprise, Hybrid Active go back to 2010 or earlier, depending on which we're talking about. "You are wrong about how APs respond to devices that send data using unsupported rates." By all means, feel free to elaborate how. "Demodulation is based on SNR, plain and simple. The only thing mentioned that doesn't affect SNR is multipath, and, yes, multipath is a rare exception." This statement completely ignores the role of processing gain, phase errors, modulation methods (QPSK, BPSK, QAM), spreading methods (CCK, OFDM, ...). SNR is a raw measurement in the RF domain (layer 1); it says nothing of errors that occur in other layers, errors that can and do occur when the SNR great. Client devices make their own decisions, period. Cisco & Extreme APs may **suggest** BSS changes, but Apple devices (and, presumably, others) usually ignore those suggestions. 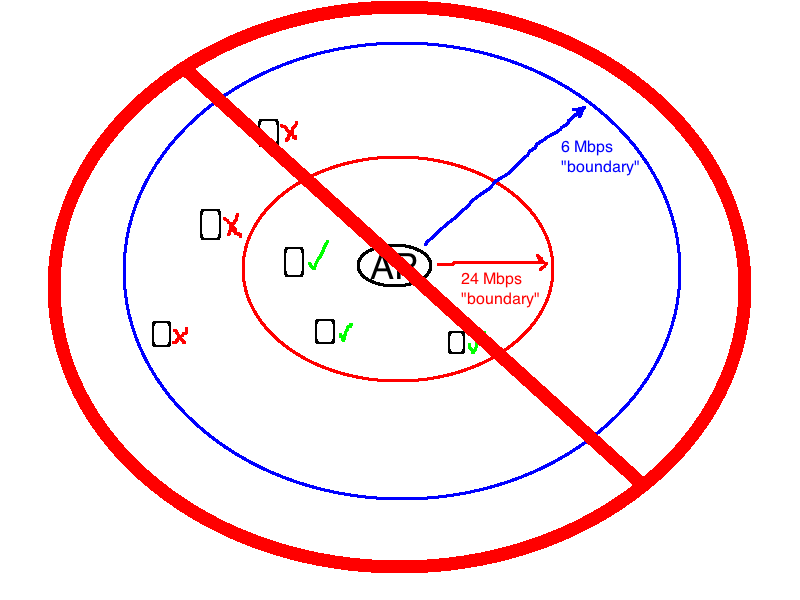 A cursory Google search of various roaming algorithms such as SRA (sticky roaming algorithm), ERA (enterprise roaming algorithm), passive scanning techniques, active scanning techniques, hybrid adaptive techniques will show why roaming is an incredibly complicated subject and that simple declarations like this article does are almost never correct in an environment where multiple clients with various chipsets and algorithms are concerned. I'm describing real world device behavior. Real devices choose when to roam and they choose when based on RSSI. 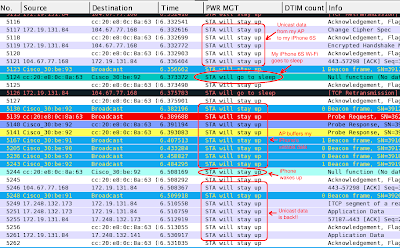 You'll see it if you ever analyze real world device behavior. "I'm describing real world device behavior. Real devices choose when to roam and they choose when based on RSSI. You'll see it if you ever analyze real world device behavior." Funny you should say that. Aside from that your response in no way addresses the points I've made, my experience goes back 20 years starting with Breezecom 3 mbps FHSS systems (pre-802.11). I've designed long distance P-t-P back-hauls, P-t-MP last mile systems and for the past 14 years at my current fortune 25 employer, distributed, high density systems across about 3000 locations encompassing many 10's of thousands of devices. I'm pretty sure my work designing, installing, maintaining and troubleshooting all of them qualifies as in the, "real world"
There are countless people in all fields of employment who have successful careers without knowing what they're talking about. Judging by your comment, you may be in that group. I've been try to understand your point and I find it interesting. However, you mention that occasionally signal at higher speed reach far away devices causing those devices to joining and thus degradating cell performance (hopefully I got correctly). But, how frequently those higher signals reach those farther clients? How can I be sure that this is really frequently enough to worry about? If I use RX SOP wouldn't I be protected as the AP does not accept clients with lower RSSI? Client devices control association. 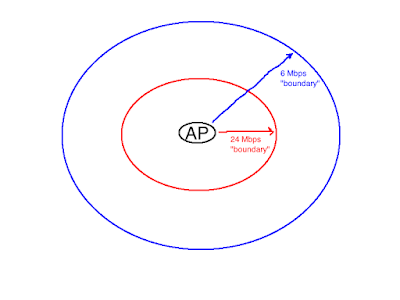 An AP could, theoretically, deny a client association attempt if the AP receives low RSSI frames from the client. That is certainly not behavior that I've seen from APs, and I am skeptical that APs would do that because it could result in client devices having no connection. Keep you low data rates and see how happy the user experience is. Are you insinuating leaving B data rates enabled?